The fifth installment of the Take Note! review series is of a CD called Hungry Ghosts by Ok Go. ‘The Writing’s on the Wall’ off Ok Go’s new album ‘Hungry Ghosts’ is one of the saddest songs I have heard in a long time. I hear in it missed connections and longing. It is a song of little hope mixed with a gigantic serving of despair. And yet the words are catchy and the music is upbeat! It feels wrong to have such a sad song be ~that~ upbeat. My brain has been full of this song for weeks. This song has taken up residence there and shows no signs of moving out. This is a shame because the rest of the album is interesting and fun and filled with songs you want to bob your head along with. If only you can get past song #2. I really enjoy reading about the process different band use to write music and lyrics. What inspires them? Damian Kulash from Ok Go shared the band’s process and inspiration for ‘Hungry Ghosts’ in this article. He explains the origin and process song by song off the Hungry Ghosts album. The music of Ok Go is so excellent and goes well with their TOTALLY AWESOME videos. Here is the video for The Writing’s on the Wall. Tags: Hungry Ghosts, new songs, Ok Go, purchase music, sad song, Take Note! The fourth installment of the Take Note! review series is of a CD called Nighty Nite by 8in8. The year 2013 conspired to make me aware, in a big way, of both Neil Gaiman and Amanda Palmer. This summer a friend invited me to a reading by Neil at the Crystal Ballroom in Portland, OR as part of his last signing tour. I was aware of him but didn’t really know anything about him. I went and was charmed by him and his stories. I found out about Amanda Palmer through the exceptionally funny and completely unsafe for work blog called The Bloggess. Jenny Lawson, aka The Bloggess, suffers from depression and writes about it regularly. One of her posts linked to an Amanda Palmer song called, In My Mind, which made me sob. This led to a post about Amanda Palmer seeing tweets from Jenny Lawson about being unable to attend Amanda’s concert because of anxiety and Amanda conspiring to make it happen anyway. At that point my heart split open, grew 3 sizes and other miracles occurred resulting in me falling a little bit in love with Amanda Palmer. Neil and Amanda are very prolific in the areas of blogging, twitter and Facebook. Through Amanda’s blog I learned about a project that the two of them worked on along with Ben Folds and Damian Kulash (from OK GO). The goal was to write 8 songs in 8 hours. They didn’t quite meet the goal. They only got to 6 songs in 12 hours. Oh my goodness! How awesome is that? Can you imagine writing, arranging and recording just one song in 12 hours? Forget 6!!! Considering I am currently working on participating in the RPM Challenge which gives us the entire month of February to record 10 songs, I’m really impressed! So back to the point of this post. No, really, it has a point! I listened to the entire album and there was one particular song that stuck out to me and that was…”Because the Origami.” I keep seeing the chilling images of the fan-made video. After seeing that, none of the other songs really had a chance. One thing I liked about the entire album was the diversity in the singers, arrangements, and musical instruments used. Also, the fact that they made the entire album in 12 hours really blows my mind. The entire album can be purchased for as little as $1 (you choose what you pay). I hope you’ll purchase it in support of crazy creative musical projects everywhere. It was really 6 in 12 but it is still impressive. The third installment of the Take Note! 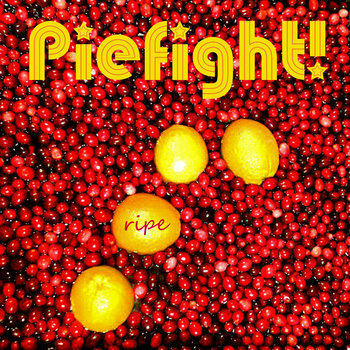 review series is of a CD called Ripe by Piefight! 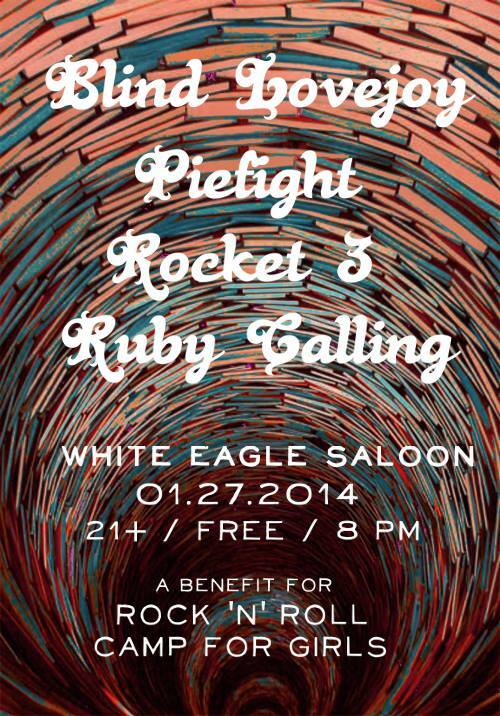 The women in Piefight! banded together via Portland Ladies Rock Camp and have created a great blend of distorted punk, funk and pop with sweet harmonies. The sound really works. I bought this CD a while ago so I went back for a fresh listen. In this series, I am trying to pick the one song that really stands out. With this CD it is so difficult!!! The song that I remembered best is the song Crush. But then listening to the CD in order…it was tough to choose between Crush and 2 a.m. But I will stick to my self-created rule and just pick one. Crush is a song that was created and performed at Portland Ladies Rock Camp by some of the current members of Piefight! I think that this song was the “ear worm” of the showcase. It stayed with me for weeks. I also videotaped the performance and made a video and so was exposed to the song even more via the video editing process. The song starts out with a catchy distorted bass line that runs through the song. From there the other instruments add in. Not only is the bass line notable but there is also a cool keyboard riff and they play off each other. The women take turns singing and sing both harmony and layered vocals like Sleater-Kinney. You really need to check this song out because it won’t let you go. Just like your feelings for your secret crush. The rest of the CD is worth a listen as well especially the aforementioned 2 a.m. If you have the opportunity to see this band live, do it! They have infectious energy. The second installment of the Take Note! review series is of a CD called Comfort Quest by Brian Hudson. Here is the backstory: my bff and I were in New Orleans wandering the streets and drinking mango daiquiris. As we walked from restaurant to daiquiri place to restaurant, we kept passing a particular street corner where a guy was playing guitar and singing. I kept slowing down as we would go by and finally we stopped and listed for a while. We heard a few songs and chatted with Brian for a while. We asked him which CD we should by and he suggested Comfort Quest. Then we returned home and I ripped the CD into my computer and loaded it on my phone. On my next run, I listened to the CD. A song we heard live was my “Take Note!” song. It is called “Food Stamp Party” and tells a story of being in a grocery store after midnight and an unexpected party that occurs. Brian is a good storyteller and the music pulls you along with some nice use of a keyboard and horns. I am not going to say anything about the rest of the songs on the CD. I will only give myself a reminder not to buy music after drinking 2 mango daiquiris. I heard the song “Royals” right around the time that royal baby Prince George was born and I couldn’t get it out of my head. (It is kind of still stuck in there!) The song is from the debut studio album Pure Heroine by Lorde. But in the spirit of actually doing what I said I was going to do with the “Take Note” series of posts, I purchased the album and listened to it from start to finish. Surprisingly, the song that stuck out to me was not “Royals” but was the track called “Buzzcut Season.” The keyboards at the beginning of the song immediately made me think of the music from Battlestar Galactica but the song quickly establishes its own identity. Lorde is the stage name of a 16 year old girl from New Zealand. Her real name is Ella Yelich-O’Connor.